I love the winter season and bringing out my cozy comfy sweaters, scarfs and boots is something I always look forward to. So when it comes to my makeup I love changing it up. Since I constantly use lip balm during this season, I’ve been obsessed with the Revlon Lip Butters. These lipstick/lip balm hybrids are exactly what I need for the windy season since I need to keep my lips hydrated. For this look I wanted to show you guys a slightly glammed up neutral look. You can never go wrong with neutral eyeshadows! I used my trusty MUA Heaven and Earth Palette. I applied a very shimmery cream shadow all over the lid and then used a dark brown shadow in the crease using a fluffy blending brush. To add a bit of color to the look I applied my favorite bright bluish green kohl eyeliner on the lower lash line from Essence in the shade Cool Breeze. For the rest of the face I kept it dewy and used a highlight on my cheeks along with a bronzer to add some definition. For that glossy berry lip, I chose a Lip Butter in Raspberry Pie to finish off the look. The lipstick isn’t an intense berry shade since it has more of a pinkish hue to it. I hope you all liked this neutral glammed up makeup. Thank you Amy for letting me guest post on your blog! I’m a beauty blogger over at MakeupMew where you can find a variety of makeup tutorials and beauty product reviews. I first got into makeup a few years ago after becoming obsessed with YouTube beauty gurus. 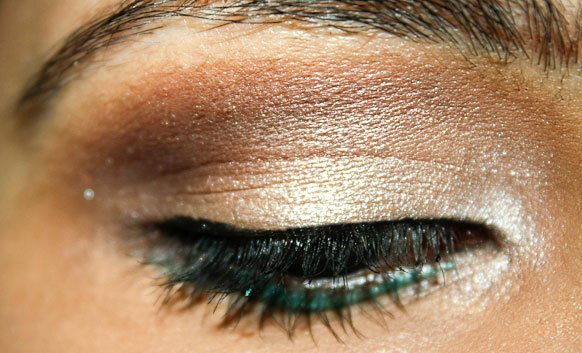 I love experimenting with bright eyeshadow colors and what better way to showcase makeup looks then with a tutorial. 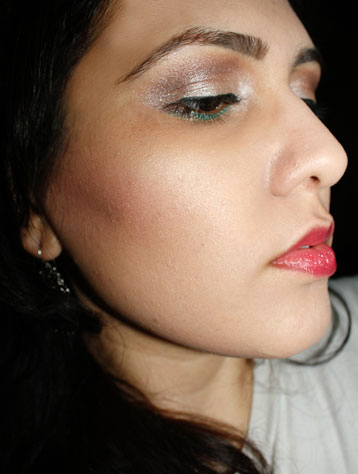 Check us out for step-by-step tutorials and makeup reviews or follow us on Twitter (@MakeupMew)!